Manufacturer of a wide range of products which include fuel briquetting press, biomass briquetting press, biomass briquetting plant and agro briquetting press. 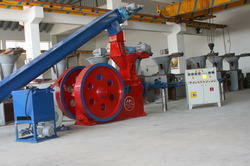 Prepared homogeneous raw material feed to the briquetting press by screw conveyor for regular feeding. In briquetting press it passes through taper die and punch & due to high pressure & heat powder form converts into solid cylindrical briquettes due to pressure & heat, lignite content of all raw material it convert in liquid form & act as a binder so in this technology there is no need to add any binder to form briquettes. 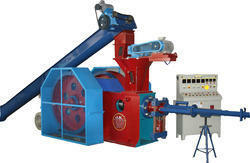 Briquettes produces from this press is 60mm dia and on production basis it is two types, one gives 550 Kg. /Hrs and second gives 750Kg./Hrs. Production. A Biomass Briquetting Press turns waste material into uniform-sized briquettes that are easy to store and in many cases, can be sold to generate revenue.Briquettes produce from this press is 90mm dia. 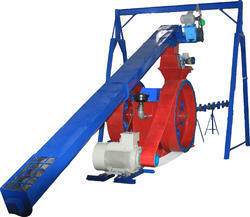 This press does not require any chemical to bind biomass. Here are Few characteristics of our briquetting machine.· Siemens Company’s motors with IEC2 which is power saver. This motors will take only 32 to 35 units per hour.· Sensor systems in die holder, main body and oil tank. If temperature raises in machine these sensors will indicate you in control panel so less chances of any accident.· Proper binding of any raw material. · For after sales service we have 2-2 technicians in all states and if there is any problem in machine they will reach to your place within 2 days. Jumbo-9075 is our highest selling machine due to its Maximum production capacity. 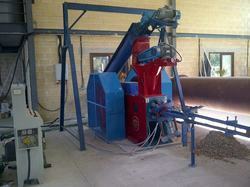 Briquetting Press is used to convert any kind of agro / forestry waste into the briquettes. Heavy structure with standard design, raw material acceptability up to 25mm size. Certain innovations made in its design and production make it exceptionally cost effective and technically superior.Delivers finished products high density with 90 mm diameter. Production capacity of this model is approximately 1500-1800 Kg/hr, depends upon the raw material being used. Power requirement to load this machine is 91 HP (68 KW), delivers cylindrical shape briquettes.Any kind of Raw material e.g groundnut shell, bagasse, saw dust, sugarcane ,rice straw, wheat straw, maize stalks, cotton stalks etc, can be converted into the briquettes through JUMBO-90 Briquetting Machine.Lower energy consumption and lower maintenance cost.Dust does not enter main body.Total Land Requirement 3500 to 4500 sq. mtr (Approx)Total weight of complete plant 8800kg (Approx. )Can be carried in single truck load or 20 MT container.